​This review has not been rated because the 6L base and handle mechanisms were inadvertently damaged during normal use. Should another sample become available, photos of the base will be added, the review will be completed, and a hip score will be assigned. Fissler’s new line of Vitavit® pressure cooker models (which include Edition, Premium and Comfort) includes lots of features to make pressure cooking easier, but added complexity also means added delicacy, and a key design feature solves a problem that most cooks do not have. The forceful pressure release, that shoots vapor in three directions, is a big safety concern. The most striking feature that makes the Fissler Vitavit® series different from its predecessors is the conical base. By solving a problem only a factory, store or owner of multiple-cookers would face (compact stacking of cookers) they created a new one. The narrower interior base, about 10 square inches (65 square cm) less than cookers of the same capacity, reduces the surface area that is in direct contact with the heat source and requires the use of smaller accessories. Translation: a roast that will fit in a cookers of the same capacity will cook diagonally in the equivalent Vitavit®. However, the tapering base has one advantage. The conical shape facilitates evaporation. When making a sauce, post-pressure cooking, the liquid can be reduced faster in the Vitavit® than in straight sided cookers. Conical Base – The opening is wider than the bottom – making storage of multiple pressure cookers of the same model easy – but reducing cooking surface. Integrated Removable Timer – Digital timer, with visual light indicators beeps when the cooker has reached pressure and automatically starts counting the cooking time when the pot has reached pressure. Removable Handle –The whole handle mechanism can be removed from the lid so that it can be washed in the dishwasher – but require re-tightening before each use. Lid Placement Guide- Facilitating correct lid position for easy placement. Multi-function Pressure Selector and Signal – The pressure regulator, and its housing, are all plastic and silicone. Selection options include High Pressure (2), Low Pressure (1), No Pressure and Pressure Release. Capacity Marks and Measurement Lines – Lines indicate the Minimum, 1/3, 1/2 and Maximum Capacity. Measurement lines in 1 liter increments are also included. Within the Vitavit® family the Edition (photographed in this review), has two short handles and includes the timer. The Premium (photographed in the safety section), has one long handle and the integrated timer can be used but purchased separately – most parts between the Edition and Premium are interchangeable since it is the same cooker base and lid with different handles and accessories. For Comfort , the integrated timer is not available, the pressure selector does not include “No Pressure” and “Pressure Release” functions and there are only capacity marks – no measurement lines. The Vitavit® lost two points in this category – due to the (mis)direction and force of the vapor during normal pressure release. Normal pressure release is performed by two mechanisms that can either be used individually or together. By pressing the same button that locks the lid and/or by turning the pressure indicator. Unfortunately, the direction in which vapor is released is inconvenient and dangerous. If the cooker is positioned so that the pressure selection dial is on the right, the hot steam is released directly towards the cook. If, instead, the cooker is positioned the opposite way the vapor from the dial is sprayed on the wall or behind the cook top to a distance of 6 1/2 feet (2 meters). Meanwhile, vapor released by pushing the button from the handle trigger splits into two and shoots vapor almost 5 feet (1.5 meters) in two directions. With vapor shooting in three different horizontal directions, it is nearly impossible to release pressure with this pressure cooker without spraying something or someone with hot vapor. Even the more primitive first-generation pressure cookers, release pressure vertically – towards the exhaust fan. When we brought this safety concern to the attention of Fissler, the representative told us that their cooker should be used with the handle facing towards the cook (illustrated in the photo on the left). We don’t recommend solving one safety hazard by creating another. To be fair, the instruction manual notes that the dial should be turned slowly. Pressure cookers have to be foolproof regardless of what the cook should do. Primary over-pressure release valve – Integrated in the pressure signal, activates to release pressure if the internal pressure exceeds the per-selected “High”, “Low” or “No” pressure setting. Secondary safety valve – A small white ball located in the handle – will kick-in should the primary pressure release valve become obstructed. Self-locking handle – When the lid is twisted shut, a button will “click” closed and change the display window from “red” to “green” to let the cook know that the lid has locked shut. When the cooker reaches pressure, this handle will prevent the cook from accidentally opening the cooker. Buckling gasket – The gasket has special notches with facilitate buckling to release pressure under the lid of the pressure cooker. 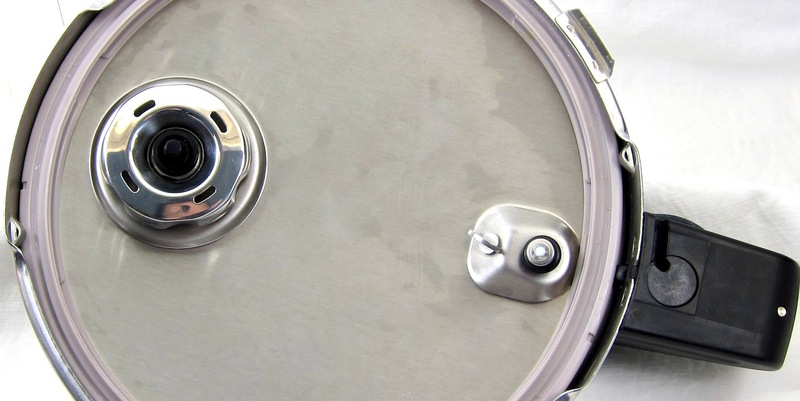 Placement Nub – A little nub within the lid’s rim retracts when the pressure cooker is closed correctly. Should the lid be placed on the cooker incorrectly, this nub will prevent the pressure cooker from reaching pressure. A surprising find with this model, and all cookware produced by Fissler, is how little things stick to the stainless steel interior. We call this almost-non-stick, but Food and Wine magazine gave their stainless steel pan (which was not coated with a non-stick coating) 2nd place of their Best New Non-stick Pans article! The pressure regulator combines two of my favorite features in one easy-to-understand package. It has the ease of dial selection (like the Fagor Futuro) with all of the advantages of an indicator bar (like the Kuhn Rikon Duromatic). On a visit to their German production facility, the product trainer shared a special trick that can only be done with their valve: The cook can stop turning the dial anywhere between High (2) and Low (1) pressure to customize the cooking pressure to Medium, Medium-High or Medium-Low pressure. The pressure indicator bar is integrated in the dial and slowly rises out of the housing giving the cook information with “traffic light” colors. Each band of color corresponds to what is happening inside the cooker: Pressure is building (yellow), selected pressure is reached (green), or too much heat and going into over-pressure (red). While the instruction manual says to turn down the heat as soon as yellow appears- cookers on a gas stove-top stopped building pressure at that point. We recommend waiting until the green band displays to turn down the heat. However, if the cooker is being used on an electric cook-top, then, we recommend following Fissler’s instruction manual and turn down the heat as soon as yellow appears. The cook can use the indicator as an additional way to release pressure, by turning the dial towards the little spray-cloud picture (see safety section for precautions). The Vitavit® has one last trick up its indicator. The little metal dot, is a sensor that communicates with the removable timer. The cook can set the cooking time on the timer, and clip it to the cooker – where the blue status light begins to blink to let the cook know it’s communicating with the cooker. Then, the light begins to blink yellow when pressure is rising. When the cooker has reached the desired pressure the timer beeps, blinks green, and starts the timer – at this point the cook can take the timer with them to keep track of the cooking time. If the timer is left on the cooker and it were to reach over-pressure the light blinks red and begins to beep insistently. The lack of working sample prevented us from testing this cooker’s efficiency against its peers. Earlier, we referred to delicacy and complexity. The more features one offers, and the more sophisticated they are… the more things that can go wrong. The removable handles and valves, for example, make cleaning a breeze (5 stars) but they need to be re-tightened before each use or – as happened about 30% of the time – the cooker will not reach pressure and leak vapor from them. The sophisticated pressure valve is very delicate. It is easily damaged if “accidentally” put through the dish-washer by a helpful spouse. We suspect that there may also be a manufacturing problem since three of the five replacement valves sent from the manufacturer did not work. Before the above-mentioned accidental pressure cooker abuse, we kept finding little black chips of plastic on the floor. While examining the cookers for this review we realized that they were falling off the Vitavit® pressure cooker handle. The handle and pressure indicator are very large and easy to remove without tools and, even with slippery, oily hands. 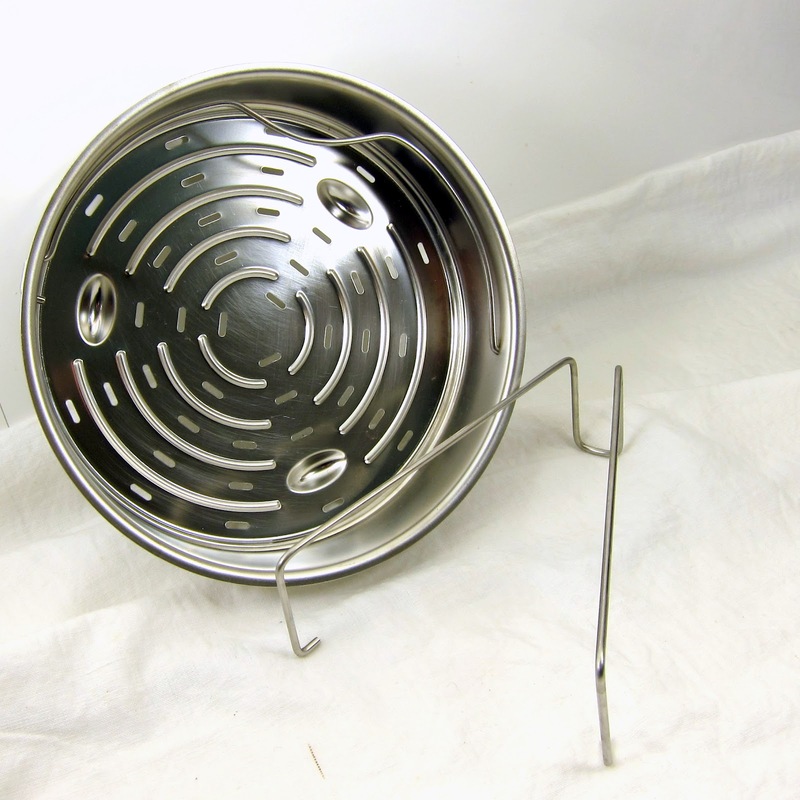 The Edition comes standard with an extra-tall trivet an steamer basket. The steamer basket is sturdy but very narrow 7.5″ (19cm) with a nested handle that decreases the usable space even more. However the trivet is about twice the height of any other trivet we’ve seen so far, specifically designed for multilevel pressure cooking. Width: (opening) 8.6″ or 22 cm, (interal base) 7.5″ or 19.5 cm, conical; Height (internal) 7″ or 18 cm; Weight: (Base) 4.6 lbs or 2087g, (Base and Top) 7.3lbs or 3298g. 3 Year Manufacturer’s Warranty (excluding wearing parts) and 10 Year availability guarantee for replacement parts. The Vitavit® Edition is a bitter-sweet series of promising and innovative features which are quickly vaporized. Manufacturers work years and spend a lot of money to bring a new model on the market – and this effort is clearly visible in the end result. This cooker ‘s innovative design has won numerous design awards for its style and features. In our opinion, great effort is no excuse for dangerously long shots of vapor and design innovation should not come at the sacrifice of precious cooking surface area. The complexity of these innovative features are the Edition’s Achilles’ Heel – making them extremely delicate and susceptible to manufacturing defects that, in our experience, cannot be easily removed from the supply chain. The superior quality of the stainless steel base, which is almost non-stick, is marred by the plastic handles that are easily chipped and cracked and valves that stop working prematurely. We look forward to seeing Fissler’s future innovations in pressure cooking and hope that they will not compromise safety or usability for the sake of design. NOTE: This review was fact-checked by the Junior Product Manager for Pressure Cookers, Roasters and Woks at Fissler, Germany prior to publication. This review has not been rated because the 6L base and handle mechanisms were inadvertently damaged. Should another sample become available, photos of the base will be included the review will be completed and a hip score will be assigned. Check local home-ware retailers to see if they carry Fissler pressure cooker, the representative told us that they prefer selling their premium brand in a store instead of making it available for sale online. Great job, as always! Why wouldn’t they send you a working model to finish the review of their pan? Something sounds fishy! Maybe they were trying to stop you from doing it? I can’t answer as to why the manufacturer didn’t do something, but I did notify them the cooker was damaged last year and sent a couple of reminders, since then. They are a professional organization so I would like to think that it was an oversight and not intentional. When I visited Germany I offered to share my thoughts about some of their features… but, no one ever asked! I think the fact that, as a general rule, this manufacturer does not want to sell their pressure cookers online speaks volumes! I’m curious… you mention several times that the base was damaged. How? I heard Fisslers are practically bullet-prrof! I don’t know about bullet-proof, but yes the stainless steel is very thick and high-quality. I did not want to mention how the damage was made because it was not part of the review process. I accidentally ran the cooker without water for 5 minutes on high heat and ruined the base (it turned bronze) and likely melted the internal aluminum disk – this was fatal to all the other components. Since I do not put all other cookers on high heat without water for 5 minutes I did not want to unfairly penalize the manufacturer for this accident – which was entirely my fault and would ordinarily not be covered by the warranty. Personally i think That they are bullet proof but the shot Will scratch the targeted surface for sure.What calibre are You going to use to do the test? Kevin, we are not equipped to *actually* test if the pressure cookers are bullet proof – that is not a criteria most cooks use to choose a pressure cooker. Though, I agree that durability plays an important part. the photos on the hot steam shots are quite dramatic. The good news is that the further you are the cooler the vapor gets. We measured the heat transfer to an object that was about 8″ away and it was still hot enough to cause a burn. I have two kids, and no matter what pressure cooker I’m using I always herd them out of the kitchen while I release pressure. I can’t emphasize enough how much we LOVED all of the features and using these cookers BUT… the fact that they damage easily and have such forceful jets of vapor are a big problem. Is there another Fissler model that you do recommend? My quote is from a year or two ago. I still feel as quoted that the Fissler Vitavit Premium (which is the same model as the Edition reviewed here) is the cutting edge in terms of features and “heft”. However, the plastic pieces falling apart and the defective replacement parts were a BIG disappointment. All of Fissler models I have right now (Edition, Premium, VitaQuick and Blue Point)are damaged in one way or the other so, UNFORTUNATELY, they are no longer the cooker I reach to first to do my family cooking, as originally quoted. 1. Releasing pressure in just ONE direction. Pick one, any one, but just one. Preferably, vertically. 2. Improving the quality of the Bake-lite so that it doesn’t fall apart when transferred heat by the stainless steel cooker. 3. Removing the defective replacement parts from the distribution channel once they are discovered and identified. I could live with a narrower base, and tightening the handles for the sake of the superior low-stick interior. Dependability and durability needs to be par to similarly priced models. I have used the Vitavit for 4 years now. Since we sail half the year it get a very harsh treatment. I have not had a single chip come of the handles! Also, I always take it apart when cleaning it and once put together again I have never had problems with leaks. It’s clearly stated that the regulator should not be submersible so I don’t understand why it is “delicate” if it breaks if you put it in water. I find the cone form very convenient since I have the “frying pan” as well (very convenient for two persons and the waffled surface is excellent for frying meat) and it minimize the storage space. All in all I could not be happier with the quality and how it works and I use it almost daily. Thanks for an excellent website!!! 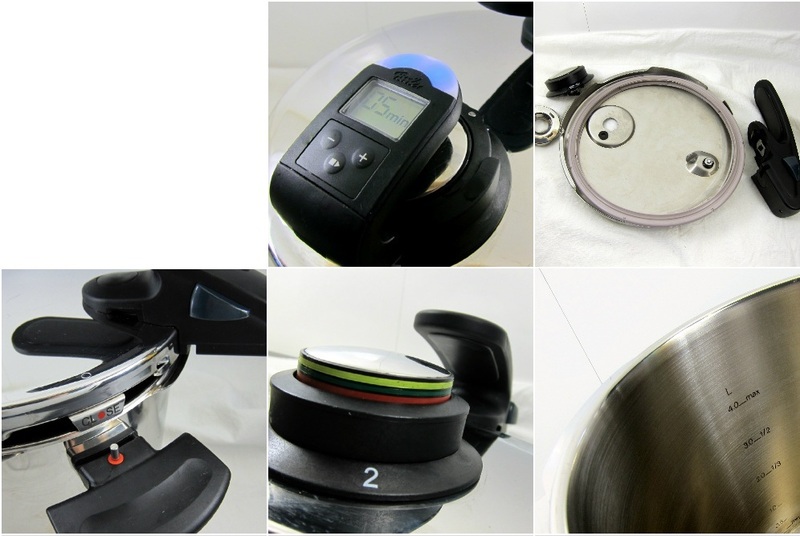 Thanks for sharing your experience with this pressure cooker and welcome! This is a follow up on previous input. I dropped the handle and a piece broke of. I can still use it but would like to replace the handle to feel safe. But a warning is in place – it has proven to be difficult to find a replacement. I will try to contact the manufacturer directly. They promise to have replacement parts for min 10 years. interesting. Have you used one, and if so, what is your opinion? I need a recommendation for a 4 qt, cost-effective PC for a friend who needs an easy-to-use cooker. I own 2 Kuhn Rikon braisers, which I think are wonderful and easy to use, but my friend is not going to pay that price. Are there smaller electric pressure cookers that would work for her? I’m concerned that some of the alternatives you review here are too complicated for her to work with. Send me an e-mail with the cookers you are considering and I’ll take a look at them! Hi Laura, I just read Cook’s Illustrated reviews on pressure cookers (Issue No. 120 – February 2013). They test 8qt models (we are lookin at 5-6) and rate the Fissler and Fagor as highly recommended while only giving the Kuhn Rikon a recommended “with reservations”. For the Kuhn they state that its base is too narrow causing scorching which made tey reduce temperatures and lose pressure. They also cited that it has high evaporation losses and does’t reach 15 psi. Have you seen this and what are your thoughts? We were leaving to the Kuhn mainly based on your review. Sorry, I don’t understand what you meant that you are “leaving the Kuhn”? I have not seen the printed capsule reviews of each pressure cooker, though I did see the information on Cook’s Illustrated website and their video. Personally, I have not experienced ANY scorching in the Kuhn Rikon – but I did not make crepes on the base like they did. What I have made are numerous jams and conserves in the Kuhn Rikon base and under pressure and NONE of them ever scorched. The excessive evaporation of the Kuhn sounds like user error to me. The Kuhn Rikon needs the SMALLEST flame I have seen to maintain pressure. If the cooker is put on too-high a flame the cooker is being run in over-pressure and will vent furiously trying to keep the internal temperature down. Since I don’t know how they performed their tests to measure pressure, I do wonder if operating the Kuhn cooker inappropriately contributed to the conclusion that it doesn’t reach 15 psi. Wow and i nearly bought this 300 USD PC !!!! It would have been TOTALLY worth it for the features alone if this cooker wasn’t so delicate! Never heard of Beem, looks good ! Might try it out. Love this web site! Wish I had known about it sooner. Your observations on the Vitavit quite concerning, as I simply don’t have room in my kitchen to have steam shooting out laterally in three directions– who does? I share your views on the conical shape, and that brings me to a question about an older – but still available – Fissler pressure cooler, the Blue Point. The 6.5 quart Fissler Blue Point has straight sides, which I like. Is this a model that you would recommend? On another subject, I attended a Williams Sonoma class recently on pressure cookers, and the instructor was using a 6 qt. Calphalon Stainless Steel Pressure Cooker that had straight sides and which cost about $200. It is made in China, but I must say, it looks nice and it performed adequatly during this class. Do you have any opinions on this model? Many thanks for any advice which you can provide. I’ve only seen Calphalon it on display at W-S so I cannot really give you an opinion on how it works compared to other cookers that I have actually used. It’s really up to Calphalon to send me a sample -though if they did I would valuate it and give you my opinion without mincing words. The Fissler Blue Point has a cylindrical base, that in my opinion, and for the reasons I stated above is superior to cone-shaped bases. Unfortunately, the valve on the blue point I had in-house began to fail on me after putting it through the dishwasher several times (the manual says its dishwasher safe) – due to what I believe is a logistics problem of getting me a U.S. Blue Point pressure valve in Europe (because Fissler tried to send me a replacement three times but it didn’t fit) I have not been able to put that cooker back into use. So if you do decide to get a blue point – don’t put the lid in the dishwasher!!! Williams-Sonoma, its a very large high-end housewares chain in America. I wanted to add a more positive comment about the Fissler Vitavit. I got one recently and have used it several times (I’m a newbie to pressure cooking). The pressure release system doesn’t bother me – I have found that gently releasing the steam works well and I have no problem avoiding the steam spray. The Fissler is built like a tank and it prepares food wonderfully. I’m looking forward to fall, when I plan to make stock and such. In the meantime, 4-minute corn on the cob is fantastic. Also, the Fissler USA store staff are exceedingly helpful; I asked many questions over several days via e-mail and talked on the phone with them in some detail before I ordered my Fissler. I even got a couple of cookbooks thrown in for free. I do not regret my purchase. Thanks for sharing your experience, it is valuable information! We have had a fissler vitavit for 2 years now, as a pressure cooker it works ok but its not built to last. We choose fissler cause we thought it would last for ages and that the quality is good unfortunately it seems that it is design by fissler for planned obsolence. AFter only 6 months it started to make a whistling sound from the valve, the valve had cracked and steam was pouring out creating a whistling sound, a loud one. After about 9 months the handle broke, I file a reclamation, they accused me of dropping it on the handle, but i quickly convinced the dealer that if they have proof of it i’d love to see it, before the the got new parts, i had to wait a month, I super glued the handle and two weeks after it broke again in a different spot. As you can see of the design where the handle is there is a metal plate, underneath is a void, so the handle is very delicate and woun’t last for lng if you lift the cooker up and down heated and then cooled off. So frankly for the price they charged us i expected a better product. Yes, my impression is that they sacrificed durability for style. No one cares what it looks like if it’s broken! Thanks for sharing your experience with us. If not Fissler pressure cooker then what pressure cooker do you recommend? I am looking for long lasting, good performance, easy handling ( cleaning, lifting ,holding ,instructions etc) . I use pressure cooker a lot especially for beans and soups. Definitely don’t want steam venting from cooker in all directions and making a mess on my kitchen wall. Personally I like my Kuhn Rikons. But then I haven’t used any other brand of stovetop pressure cooker. Have you checked out Laura’s other reviews? Vaishali, please take a look at our reviews – there are several pressure cookers that fit the bill at all price levels! How is All-Clad pressure cooker? I bought Vitavit Comfort Fissler. Pressure cooker. Can I used digital timer with this one. I don’t think so, the Vitavit pressure signal has some component that informs the timer of its status (now pressure/pressure) and unless the Comfort also has this component the timer won’t know when to start.